Thanks so much for visiting my site! 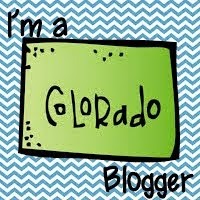 The resources, ideas, suggestions, and freebies found on this site and through my email subscription are copyrighted by The Colorado Classroom and all rights are reserved. You may use the information and materials found on this website and through this email subscription ONLY for PERSONAL USE in your own classroom. Placing any of this content anywhere online is a violation of the Digital Millennium Copyright Act (DMCA). *This list is provided only as an example, and is not a complete list of prohibitive activities. Copyright (c) 2016. The Colorado Classroom. All rights reserved. While using my site, I may ask you to provide me with certain personally identifiable information that can be used to contact or identify you. Personally identifiable information may include, but is not limited to, your name and email address. Like many site operators, I collect information that your browser sends whenever you visit my site. This Log Data may include information such as your computer's Internet Protocol ("IP") address, browser type, browser version, the pages of my site you visit, the time and date of your visit, the time spent on those pages, as well as other statistics. In addition, I may use third party services, such as Google Analytics, that collect, monitor, and analyze this information. If you sign up for my email subscription service, I will only use your personal information to contact you with newsletters, marketing, promotional materials, or other resources and ideas that may be helpful to you or your students. If at any time you want to opt out of these emails, you may simply click the "Unsubscribe" link at the bottom of any email. Cookies are files with small amounts of data, which may also include an anonymous unique identifier. Cookies are sent to your browser from a web site and stored on your computer's hard drive. Like many sites, we use "cookies" to collect information. You can instruct your browser to refuse all cookies or to indicate when a cookie is being sent; however, if you do not accept cookies, you may not be able to use some portions of this website. The security of your personal information is very important to me, but please remember that no method of transmission over the Internet, or method of electronic storage, is 100% secure. While I strive to use commercially acceptable means to protect and ensure your personal information, I cannot guarantee its absolute security.